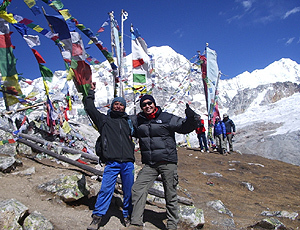 I’m KJ from Malaysia who had recently (Oct 2012) completed a fantastic 10-day trek to Langtang Trek with Lal Gurung from nepalindependentguide.com (Nepal Wilderness Trek agency). Among few of my previous treks that range from Everest-Gokyo via Chola Pass, Ladakh, Source of Ganges to the easy Singalila Trek in India, the recent Langtang trek absolutely stands out in my memory, not only because of the beautiful mountain view of Lantang along with its rich fauna & Tamang culture, but most importantly it was the great hospitality and companionship extended by Lal Gurung that made the trek fabulous and memorable. Lal Gurung knows the area and culture well and would not hesitate to accommodate any reasonable request shall I wish to understand more about the local culture or make changes in my itineraries/activities. He has been merely one of the best guides I’ve ever trekked.